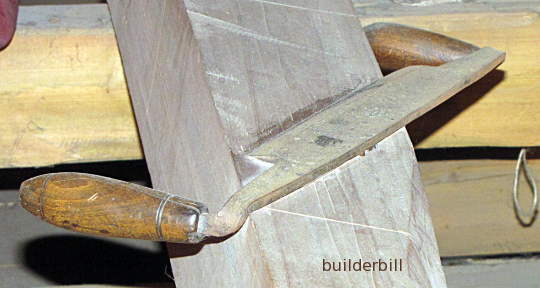 In woodworking, two handed tool for shaping mainly in the round or curved sections. Used by wheelwrights, coopers, boat builders and others. A person who makes or made wooden barrels. 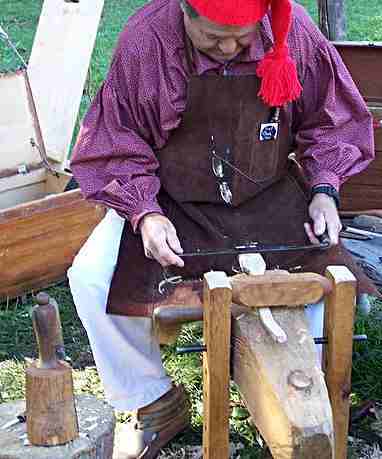 A person who makes or made wooden wheels. The tool is an overgrown version a spokeshave with the handles at right angles to the cutting edge instead of parallel. The two tools would be used together in many shops. It has a slightly convex edge so depending on how it is held it can produce slightly convex, flat or round surfaces. It is a basic tool for roughing out curved or round shapes quickly. Used particularly by wooden boat builders and in the past by coopers and wheelwrights. 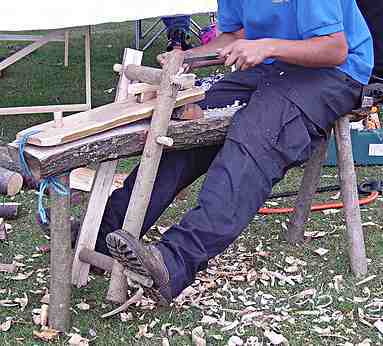 The photograph below is of a bench that is used for doing draw knife work. The worker would sit facing left and use his feet to clamp the work piece via the curved swinging section. This would make it very easy to move the work piece about, unlike say if the work was held in a vise. Incidentally, the bench itself is an example of draw knife work. A small shavehorse showing detail how the work is held. As with most of these old time crafts the art of working green timber has been with us a long time, but it does seem to be having a bit of a revival. 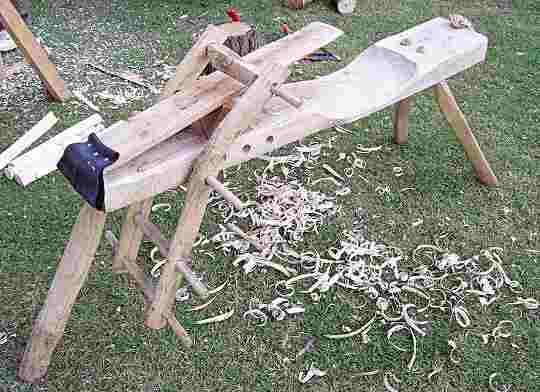 Every green woodworker starts off by making their own tools so as a result there would be no such thing as a shop bought shavehorse. As the name suggests the drawknife is pulled towards the body. The photo above shows the size of the tool, but it is by no means just a roughing in tool, it can indeed quickly turn split timber into round sections ready for working with a lathe, but as this photo shows it can be used for small detailed work.